'God won't give you more than you can handle.' This is one of the most common and least helpful reassurances floating around Christian circles. It is anything but biblical. The truth is that God does allow a lot more than we can handle. But why? 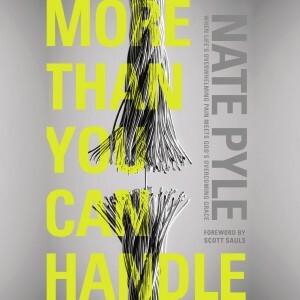 Nate Pyle has walked through tragedy in his own life--professional uncertainty, the intense impact of mental illness, and the struggle to build a family because of a lost pregnancy, infertility, and adoption. As a pastor, Nate has cried with countless people experiencing deep and overwhelming pain. They want answers but perhaps even more, they want someone to sit with them as they lament. Cliché Christianity tells us not to ask questions in hard times. Yet transformation awaits us in the dark night of the soul. In More Than You Can Handle, Nate asks with you: 'God, where are you in this pain? Why don't you step in and act?' Because when we courageously bring all of who we are to all of who God is--and stop pretending we can 'handle' life--we encounter the God of Redemption. The good news isn't that we can handle everything, but rather that God promises to be with us at the very moments we can't handle anything. Skillfully weaving together his own story, the stories of others, and a powerful look at the life of Jesus, Nate delivers a fresh and timely response to the pain we each experience. As Nate reminds us, the only thing more overwhelming than the pain of life is the love of a God who carries that pain with us. Man Enough challenges the idea that there is one way to be a man. The masculinity that pervades our church and culture often demands that men conform to a macho ideal, leaving many men feeling ashamed that they’re not living up to God’s plan for them. Nate uses his own story of not feeling “man enough”, as well as sociological and historical reflections, to help men see that manhood isn’t about what you do, but who you are. It’s not about the size of your paycheck, your athletic ability, or your competitive spirit. You don’t have to fit any masculine stereotype to be a real man. In our culture and churches more thoughtful, quieter, or compassionate personalities, as well as stay-at-home dads, are often looked down upon; and sermons, conferences, and publications center on helping men become “real men”. This pressure to have one’s manhood validated is antithetical to Gospel living and negatively affects how men relate to each other, to women and children, and to God. 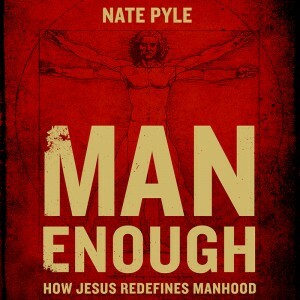 Man Enough roots men in the Gospel, examines biblical examples of masculinity that challenge the idea of a singular type of man, and ultimately encourages men to conform to the image of Jesus—freeing men up to be who they were created to be: a son of God who uniquely bears His image.